After a long time away, ambient prodigy Marcin Drabot returns to Earth Mantra with another collection of fathomless textural music, this time a trio of captivating pieces from his Aairria project called Katharsis. We will confess from the outset that our admiration for Drabot's music extends very far and very deep. We consider him nothing less than one of the premier ambient artists active today, having created several pieces that we would call classics, essential listening for anyone who claims to love this genre. Needless to say, when Marcin gave us the opportunity to release another album by him, we literally jumped at the chance. And what a release we have in store for our listeners. 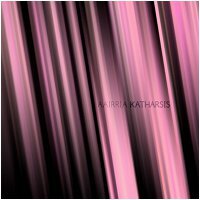 Perhaps unlike the artist's excellent 2007 Earth Mantra release Nasti, the music of Katharsis covers a surprisingly broad swath of the ambient landscape, at times dark and mildly foreboding, other times mellow and contemplative, and still other times textural and abstract. Our amazement at Marcin's mastery of so many ambient forms never ceases, and we think Katharsis makes a particularly apt introduction to his music for those who are unfamiliar, as well as a singularly welcome addition to his catalogue for those who have long enjoyed his work. Remarkably well done. In fact, though we may never cherish anything Marcin produces as much as his magnum opus Inside My Room, Watching The Rain, a release that we consider to be the penultimate ambient composition ever made by anyone anywhere. we find the music of Katharsis to stand up very strongly against even this towering standard. Such a lovely collection of colors, mingled together so tastefully, that we have to say this is one of the best releases Marcin has ever produced. The compositions are especially well crafted, and complement each other aesthetically on multiple levels. This is the kind of music that suspends time, the sort of experience that speaks to a deeper consciousness well below the surface, something that you will want to hear again and again. So it is with great pleasure that we announce the second release by Aairria on Earth Mantra, the brilliant and evocative Katharsis. It has been much too long since the last time Marcin Drabot has shared his music with our audience, and we hope that it will not be nearly so long until we again have the privilege. Highly, highly recommended. How/where can I buy your music?? A trippy expansion of time.